The Volunteers of America program seeks to ready them for the workforce and a successful life. 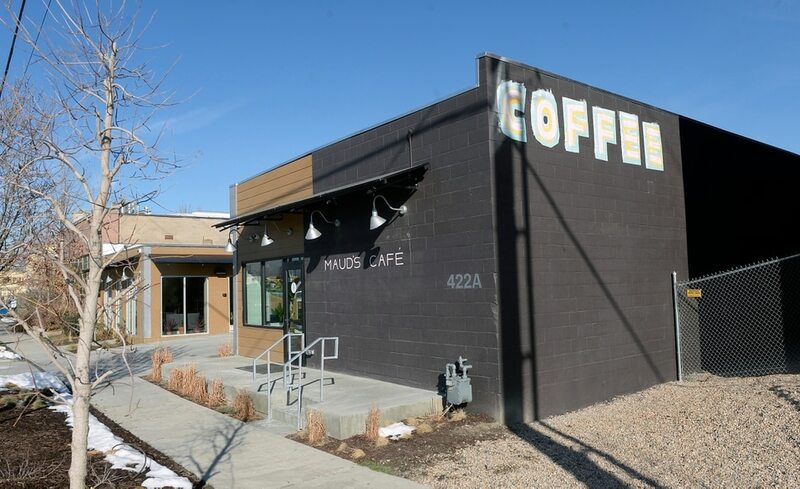 (Al Hartmann | The Salt Lake Tribune) The newly opened Maud's Cafe at 422 W. 900 S. in Salt Lake City. The cafe-coffee shop gives youth living at VOA's shelter a chance to gain work experience and a little money before taking on the world. 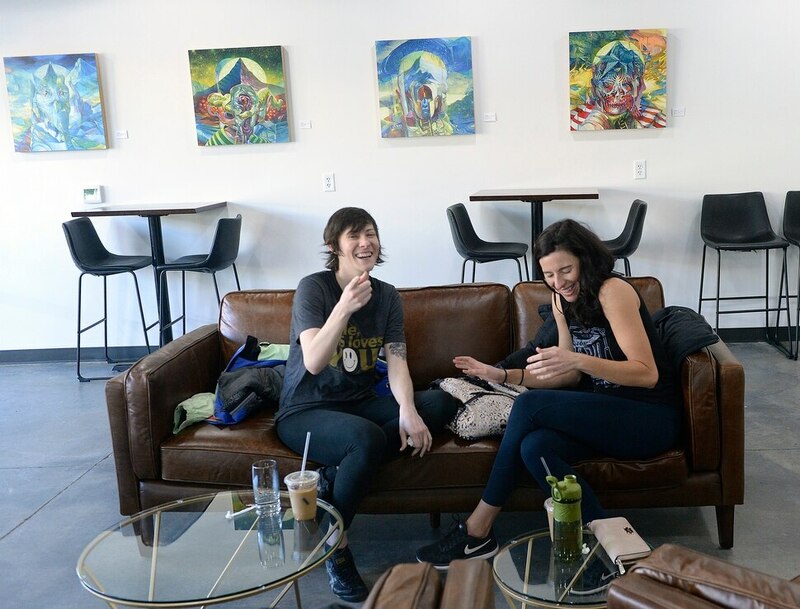 (Al Hartmann | The Salt Lake Tribune) Customers Jamie Coates, left, and her sister Julia LeBaron enjoy a laugh and coffee at Maud's, a cafe-coffee shop at 422 W. 900 South, Salt Lake City. They visit the cafe for coffee after their twice a week yoga class. The cafe-coffee shop gives youth living at VOA's shelter a chance to gain work experience and a little money before taking on the world. (Al Hartmann | The Salt Lake Tribune) Maud's, a cafe-coffee shop at 422 W. 900 South, Salt Lake City, gives youth living at VOA's shelter a chance to gain work experience and a little money before taking on the world. (Al Hartmann | The Salt Lake Tribune) Jennifer Salceda, 18, works at Maud's Cafe at 422 W. 900 South, Salt Lake City. The cafe-coffee shop gives youth living at VOA's shelter a chance to gain work experience and a little money before taking on the world. (Al Hartmann | The Salt Lake Tribune) William Heinig, 21, works at Maud's Cafe at 422 W. 900 South, Salt Lake City. The cafe-coffee shop gives youth living at VOA's shelter a chance to gain work experience and a little money before taking on the world. Heinig wants to be a truck driver. (Al Hartmann | The Salt Lake Tribune) Jennifer Salceda works at Maud's Cafe at 422 W. 900 South, Salt Lake City. The cafe-coffee shop gives youth living at VOA's shelter a chance to gain work experience and a little money before taking on the world. Salceda is working toward becoming a certified nurse assistant. 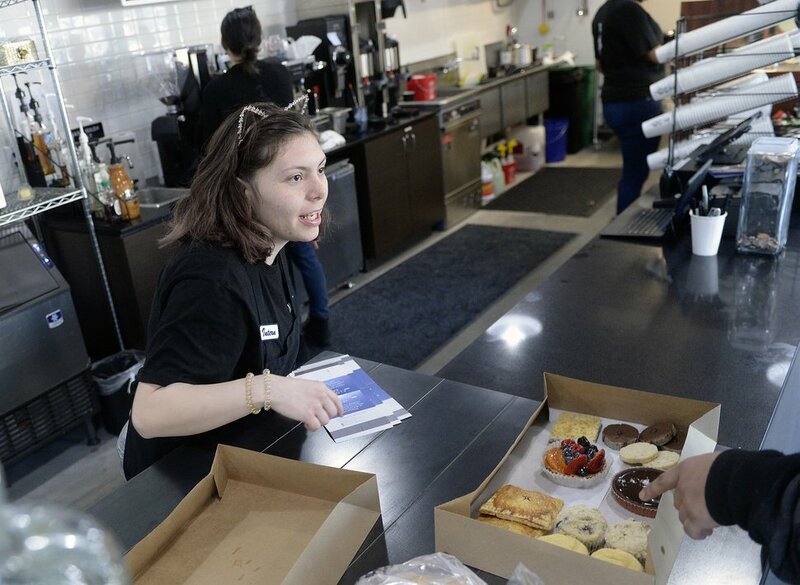 (Al Hartmann | The Salt Lake Tribune) Hope Jones, 19, works the counter in the newly opened Maud's Cafe, 422 W. 900 South, Salt Lake City The cafe-coffee shop gives youth living at VOA's shelter a chance to gain work experience and a little money before taking on the world. Jones has completed her training to be a certified nurse assistant. (Al Hartmann | The Salt Lake Tribune) Manager Kiara Polee stocks the pastry case at Maud's Cafe, 422 W. 900 South, Salt Lake City. The cafe-coffee shop gives youth living at VOA's shelter a chance to gain work experience and a little money before taking on the world. 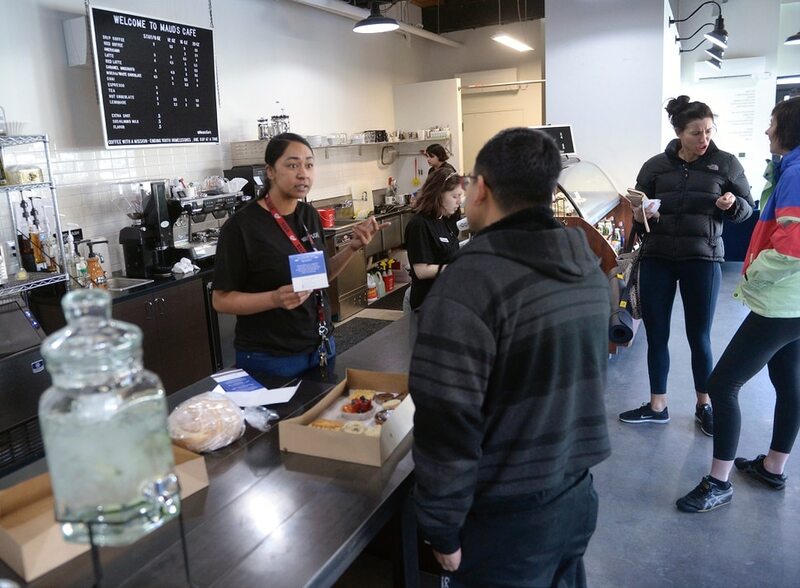 The chill new coffee stop in Salt Lake City is staffed with homeless youths, who couldn’t be happier to find themselves on an upward track after some tough times. Maud’s Cafe at 422 W. 900 South in the Granary District — the former warehouse and industrial area that’s undergoing a makeover — gives young adults a chance to get training and job experience and work for an hourly wage. The operation was launched in January by Volunteers of America-Utah and is next to the nonprofit’s Homeless Youth Resource Center. For Salceda, who lives at the resource center, the VOA is a godsend. She got kicked out of her Kearns home in December and was living in a nearby park with her boyfriend. Maud’s is open from 7 a.m. to 2 p.m. Monday through Friday. Beyond coffee, the offerings include bagels, croissants and a host of other baked goods, along with burritos, salads, sandwiches and soup. The homeless baristas — or interns — are paid $8 per hour through the program, which is tailored to each individual, manager Kiara Polee said. Another Maud’s intern, Hope Jones, 19, graduated with honors from Highland High School when she was 17. She had been in foster care for three years while her mother was in prison. About the time Jones finished high school, she was reunited with her mother. But times were tough because, as a felon, her mother couldn’t find work. Jones set off for Los Angeles. But the sojourn proved to be difficult. Eventually, she made her way back to Salt Lake City. (Al Hartmann | The Salt Lake Tribune) Hope Jones, 19, works the counter in the newly opened Maud's Cafe, 422 W. 900 South, Salt Lake City The cafe-coffee shop gives youth living at VOA's shelter a chance to gain work experience and a little money before taking on the world. Jones has completed her training to be a certified nurse assistant. Maud’s and the VOA resource center provide a community of young people who all have faced tough challenges at an early age. Jones has worked a variety of jobs, including cleaning restrooms at Salt Lake City International Airport. Like Salceda, she enrolled in a certified nursing assistant program and needs only to pass the state certification before she can begin work. She’s already had several interviews. The future, Jones said, looks bright. It will take a lot of work, but she can imagine her life one year from now when she hopes to have her own apartment and a car. The cafe was the brainchild of Jessica Norie, president of Artspace, which has its Greenery and Solar Gardens projects nearby, explained Cathleen Sparrow, VOA’s chief development officer. Artspace owns the building that houses Maud’s. The cafe training program is 12 weeks long. The interns’ hours are built around their studies and other programming, Sparrow explained. VOA hopes 24 interns will complete the program each year. William Heinig, 21, wants to be a truck driver. He had been homeless since June 2016, when he arrived in Utah. Originally from the Syracuse, N.Y., area, Heinig found his way west after being kicked out of the house. As a practicing Mormon, Heinig wanted to come to Salt Lake City. The church paid his airfare here, but he soon found himself at The Road Home shelter. After a month or so, he was directed to VOA’s Homeless Youth Resource Center. After living at the resource center, Heinig was able to get into the nonprofit’s transitional housing for men. He now is looking forward to completing a commercial driving program through Salt Lake Community College. The young baristas add to Maud’s vibe, said businesswoman Julie Coates, who lives nearby at Artspace and likes to hang out at the new cafe. The cafe is named after Maud Ballington Booth, who co-founded the Volunteers of America in 1896. VOA began Utah operations in 1986. The agency’s Homeless Youth Resource Center in Salt Lake City opened in May 2016. VOA-Utah serves more than 10,000 people a year, dealing with homelessness, addiction and mental illness. For more information on VOA, visit www.voaut.org.